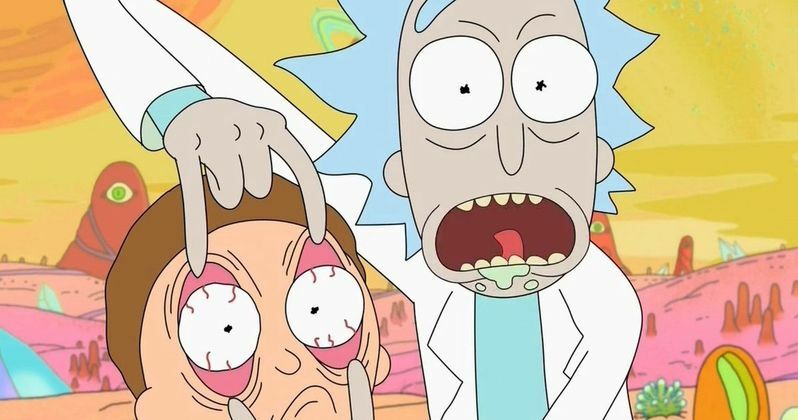 Rick and Morty fans are getting a bit restless as they wait for the third season of the Adult Swim show to finally air. The good news is that when it does, it will be a 14-episode season as opposed to 10 like the first two were. The bad news is, we still have to wait. However, in order to help tide fans over, Adult Swim has released a new sneak peek at Rick and Morty season 3 online, which has a great Star Wars reference in it. The sneak peak came during a recent Adult Swim livestream and was later uploaded to the Rick Sanchez YouTube channel. Unfortunately, the animation is still really rough in this sneak peak, which has Rick and Morty going on a "quick" adventure that winds up nearly getting them killed. However, after they retrieve a plasma shard for a princess, they are rewarded with a massive ceremony that is clearly an homage to the end of Star Wars: A New Hope. That winds up being kind of timely, since Rogue One: A Star Wars Story is currently tearing it up at the box office and connects very directly to the events of that movie. The rest of the footage is loaded down with what Rick and Morty fans have come to expect from the show. Lots of cursing, lots of banter and lots of weird, action-packed sci-fi comedy. That is great, but this sneak peek also makes it seem like Rick and Morty season 3 is further away than we may have thought. For months it seemed like we would be getting new episodes before the end of 2016, but we are mere days away from the new year and this video is as much as we've seen since season 2 concluded. All of this waiting will hopefully pay off, because if there was one animated show that absolutely exploded in the last year, it was without a doubt Rick and Morty. The show had a tremendous first season, but it caught on like wildfire in season 2, and now fans are absolutely clamoring for more. Animated or not, many fans consider Rick and Morty to be one of the best sci-fi shows on TV right now, so there is a lot riding on season 3. That means it is probably good that Justin Roiland and Dan Harmon are taking their time with it, but that doesn't make it any less frustrating for those who want to see more Rick and Morty. Here is what co-creator Dan Harmon had to say about why it is taking so long to get season 3 done at San Diego Comic-Con over the summer. At the moment, Adult Swim hasn't even announced an official release date for Rick and Morty season 3, but we can be sure it will air at some point in 2017. Fortunately, there have been plenty of little nuggets like this to keep fans happy until the new season is finally finished and ready to air. Be sure to check out the new Rick and Morty season 3 sneak peek for yourself below and keep an eye out for the Star Wars reference at about the 1:30 mark.